Veronika Miller, CEO of Modenus, is rolling out more and more BlogTours covering the major design capitals around the world. Just back from Las Vegas and the KBIS show, they are now getting ready for the next one (in less than a month!) in New York City. There will be events that focus on design as well as a visit to the Architectural Digest Home Design Show. New this time will be meetings with photographers, stylists, designers and others that will make this a learning event as they share their tips and tricks. I am delighted (excited / humbled / thrilled!) to be included in this BlogTour! New York City may be in my backyard but there is so much there that I never get a chance to see. I am looking forward to absorbing as much as I can. I also can’t wait to meet the other bloggers and learn with the pros during the BlogTour events. 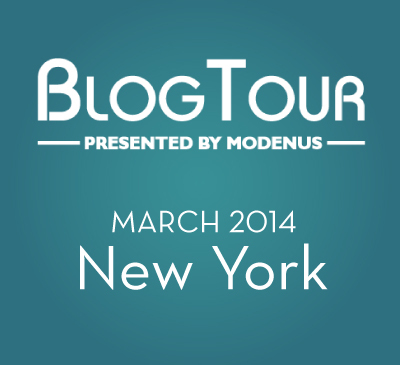 Follow along on Modenus’ blog for more BlogTour information and lots of design news. This entry was posted in B, BlogTourNYC, M. Bookmark the permalink.